Two people have been left with "life-changing" injuries after a corrosive substance was thrown on to them through their car windows. 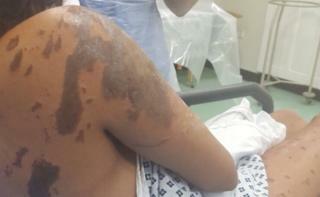 Resham Khan and Jameel Muhktar were attacked on 21 June at traffic lights in Beckton, east London. The cousins had been celebrating Ms Khan's 21st birthday before the attack. Both suffered severe burns to the face and body and Mr Muhktar, 37, was placed in an induced coma. No arrests have been made, police said. Both continue to be treated in hospital. Ms Khan has damage to her left eye and required two skin grafts. Mr Muhktar, who has since been brought out of his coma, has burns across his body arms, legs, back, neck and the right side of his face as well as damage to his right eye. On social media, Ms Khan said: "I'm devastated. I keep wondering if my life will ever be the same. Acid attacks in the UK are unheard of for me. "The pain was excruciating. I was struggling to close the window. My cousin struggled to get us away. I saw my clothes burn away in front of me." According to police the two had stopped at traffic lights during their drive when the man approached them and threw the toxic substance at Ms Khan through the window. The attacker then circled around the car and threw more of the acid at Mr Muhktar, before eventually fleeing the scene. In 2016-17, there were 398 victims of crimes involving "noxious or corrosive" substances, such as acid. This compares with 146 in 2012-13. Violence with injury is the main offence to have seen a rise. In each of 2015-16 and 2016-17, there were 191 victims, compared with 67 in 2014-15. Noxious or corrosive substances have also been used in five rapes between April 2012 and March 2017. Not all these incidents will involve acid. Because of the way the Metropolitan Police recorded the data, the figures show all victims of crimes where any "noxious or corrosive" substances were used. The force released the figures under the Freedom of Information Act.